Government Of Telangana Director of School Education Issued Rc.No.44/PS2/2019 For Details Called For Required Vidya Volunteers For The Academic Year 2019-2020. And Also TS Government is Going To Re Engage Vidya Volunteers For The year 2019-2020 Till Newly Recruited Regular Teachers Join Duty For Smooth Functioning Of School. TS Govt May Re Engage Vidya Volunteers VVs From the date of Reopning of The school i.e, 01-06-2019 or any Other Date may be indicated by the govt. 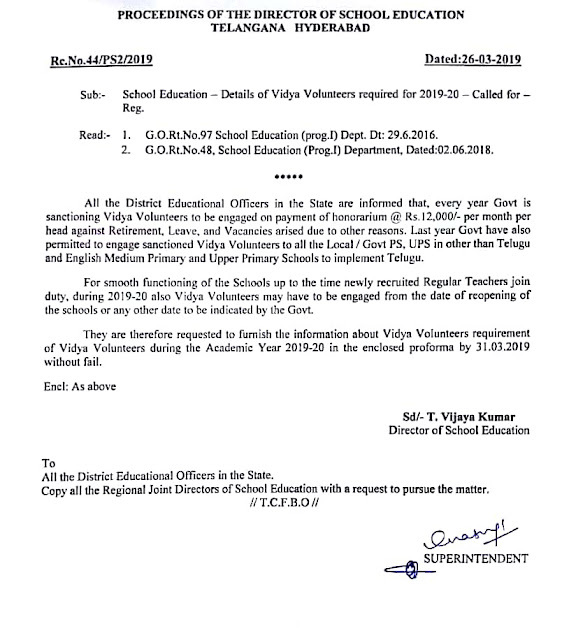 TS Director of School Education Also Requested to Furnish the Information about Vidya Volunteers VVs Requirement During the academic year 2019-2020 in prescribed proforma by 30-03-2019. 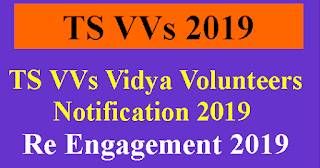 Details Of Re Engagement of Vidya Volunteers VVs Updated Soon Keep Visiting This Page For Latest updates about TS VVs 2019 information. 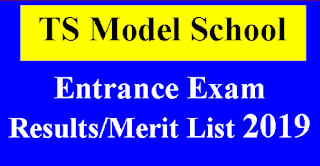 Telengana model school Merit List/Results will be Released on 18-05-2019 with Model school wise merit list and Selection List will be Available from 27-05-19. Finalised by join collector on Telangana Model school Official Site and TSMS Certificate Verification will be held at all Model school from 28-05-19 to 30-05-19. *if any Delay Contact TSMS Official Site. TS VVs Online Applications May be start in the last week of May or first Week Of June 2019. Government accorded permission to engage 16781 Vidya Volunteer during 2018-19, which includes 15,473 Vidya Volunteers against the Sanctioned Vacant Posts due to Retirement, Long Leave Vacancies etc,. And 1308 Vidya Volunteers in all Local / Govt PS, UPS& HS in other than Telugu and English Medium Schools to implement Telugu For Academic Year 2018-19. 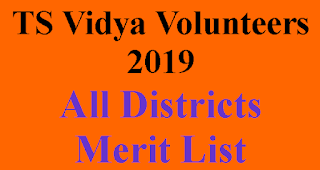 The honorarium to the Vidya Volunteers is Rs.12000/- (Rupees Twelve Thousand Rupees only) per month per head. Note: Study Material, Data and Information provided free of cost by www.baigacademy.in is prepared by own and some are collected from various sources or any one of them, offered by organisations, websites, portals or their representatives. Users must seek authentic clarification from the respective official sources for confirmation. www.baigacademy.in is will not be responsible for any errors and omissions in the information provided in this site.